Where has all the time gone? I can’t believe I have just a few days left before returning to Canada. What is worse, is that it is freezing up there. Here in Laos, winter has left and it is HOT! 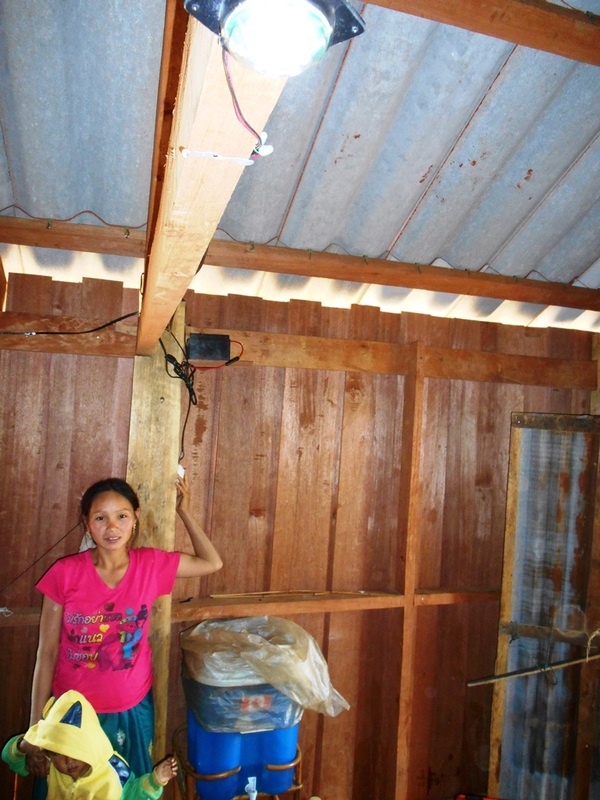 Nevertheless, our projects continue and will continue until they are done. While nothing ever seems to go as planned here, we have made a lot of progress. 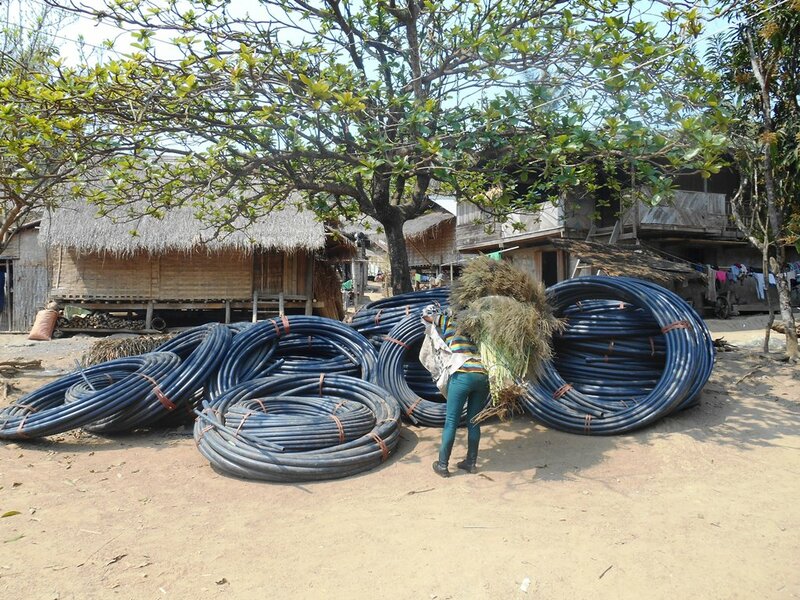 We are currently working on another large water project for Ban Na Lea but it will be another month before it is completed. Most of the materials have been delivered and I have a very competent coordinator that will see things through to the end. 3.5 km’s of trenching have been dug and the pipe is now in – we are just waiting for the engineer to arrive to construct the dam and the huge water tank for the village. This lady had no idea she would be front and centre in this picture but it gives you perspective. She is carrying plant material to make brooms. 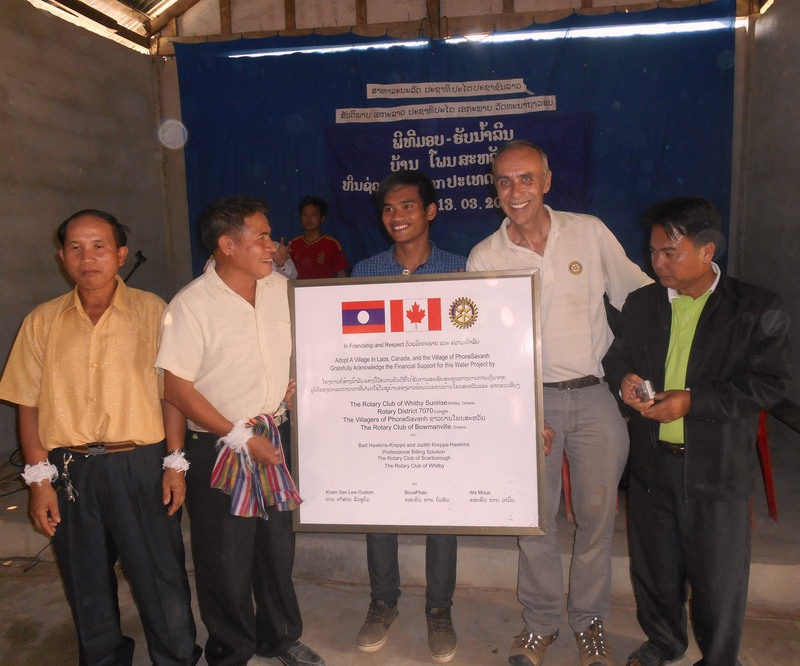 Our next stop was to go to PhonSavanh to deliver the sign and celebrate the completion of the huge water project there. 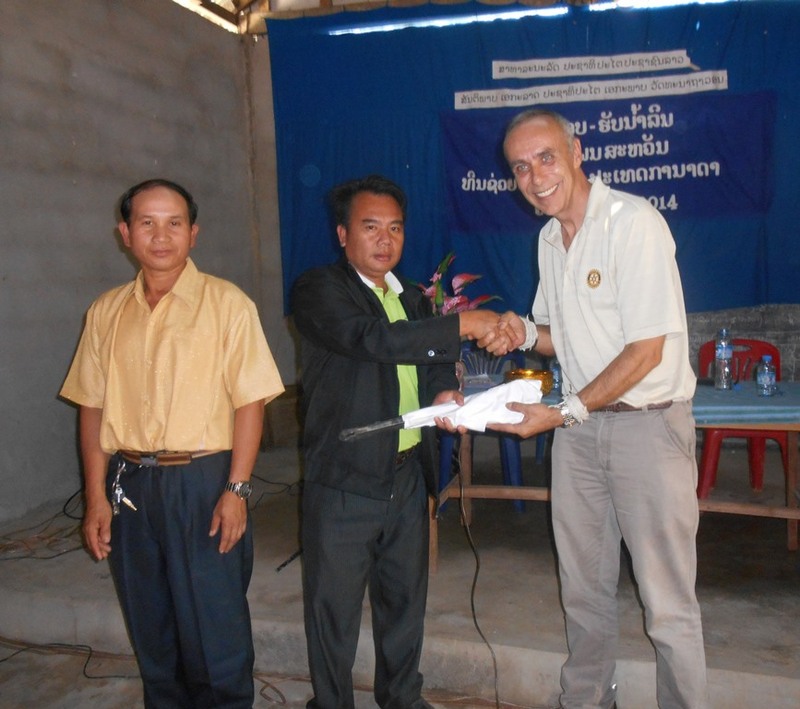 The official hand-off was to hand a pipe-wrench to the village chief! 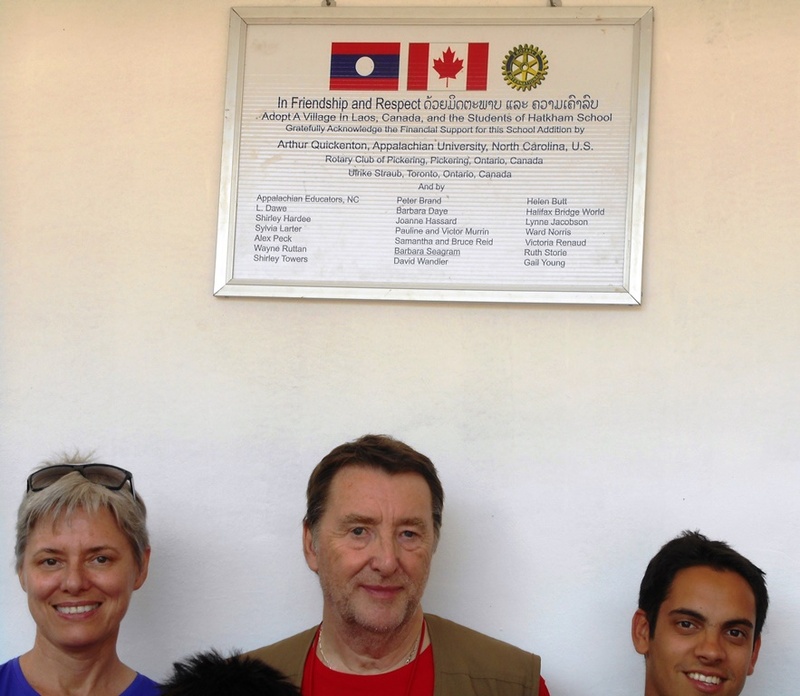 During the celebration I had brought visitors to our projects form Saskatchewan, Alberta and from New York City. They have all be strong supporters over the last couple of years. The celebrations are always expensive for me because I generally do not claim it as an expense against our projects costs but the villagers really look forward to spending time with us and offering their personal thanks through the Baci offering and of course the party that follows. All the women want to dance with the falang (foreigners). I won’t bore you with yet another baci picture but to give you some perspective, I managed to take a shot (and a rather poor one due to the bright light coming through the doorway, because I was seated at the front) of the audience. This consisted of only the team leads, their spouses and others who were an integral part of the project. 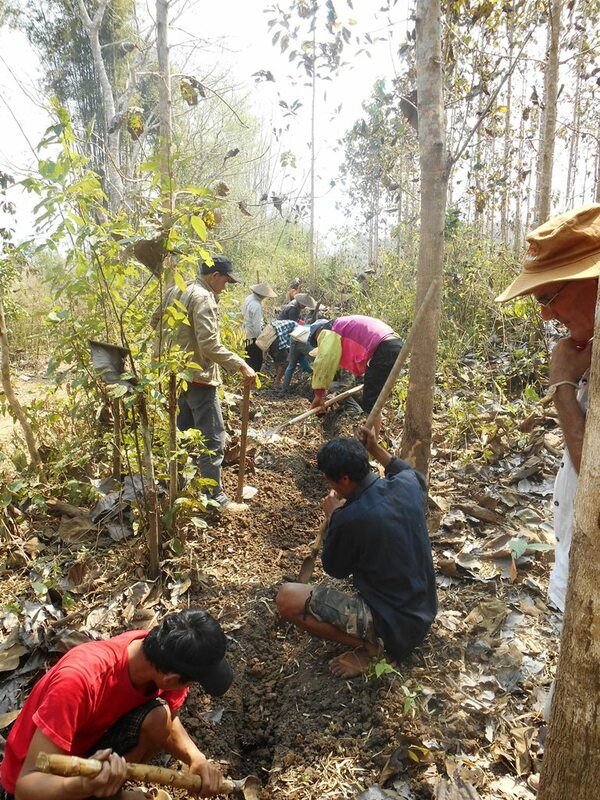 I should mention that the villagers also donated about $7000 for this project. Note the holes in the roof. They borrowed the chairs from the school for the celebration but have since asked for help in that regard. 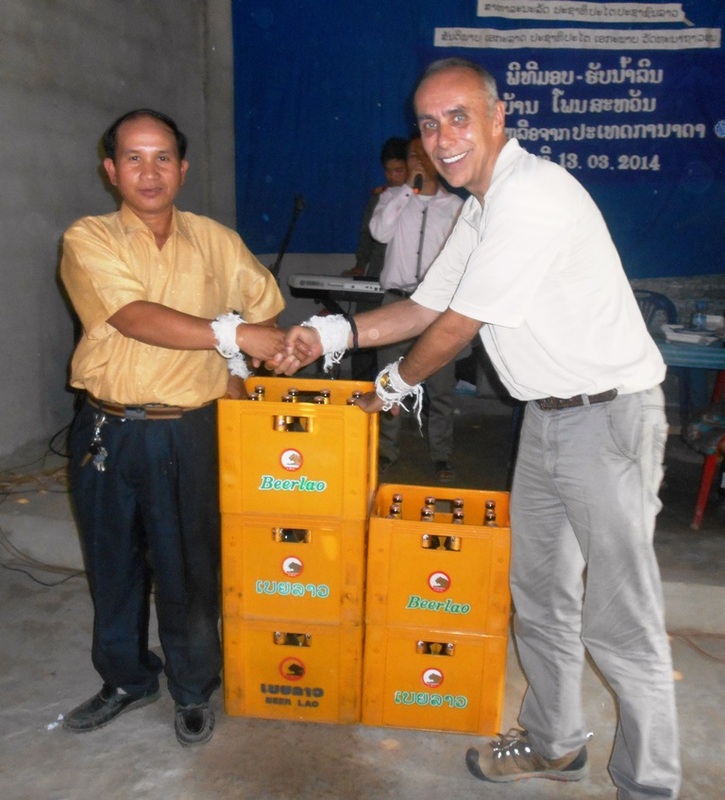 Cheaper than bottled water, Beer Lao was offered to the villagers. That was just the first 5 cases! We delivered the sign and of course, another photo op, presented itself to us. Thanks to al of you for your support. The entire audience broke out into rhythmic applause. I wish you could have been there with us to celebrate. I mentioned this in our last post but it is worth repeating I think. The villagers have been troubled with the lack of water for so many years now and it is such a delight to hear the comments from them. Most homes looked temporary and I found out that it was because many families were wanting to move for lack of water. They have told me that with this gift, they can now build toilets and better houses and they continue to thank me from their hearts. We headed up for a couple more village visits, but as we returned through this village, they already had built a wonderful structure to hold the sign. They wanted me to be able to see it before I headed home. Wow! While we were on the area, we dropped by a secondary school. The school was huge – I didn’t count the classrooms but they surrounded the football field and at the back, they were two buildings deep. They had a library but it was very poorly equipped. 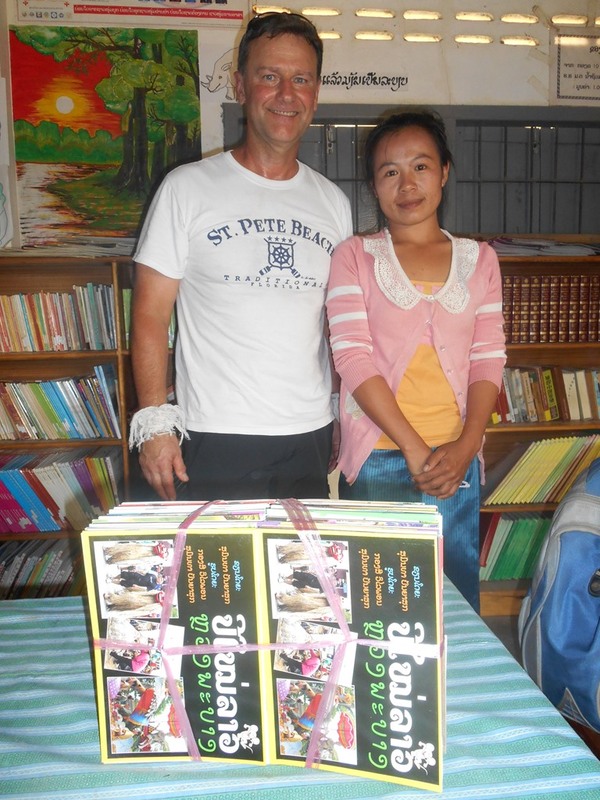 Kevin was kind enough to donate teachers training kits of books to assist in training the classes. He even dropped into an English class that was in progress and being trained by a student teacher – on a two month assignment from the college here in Luang Prabang. Kevin Hope offering hope to the librarian with teaching assistant materials. We still have two more kits to distribute on his behalf. 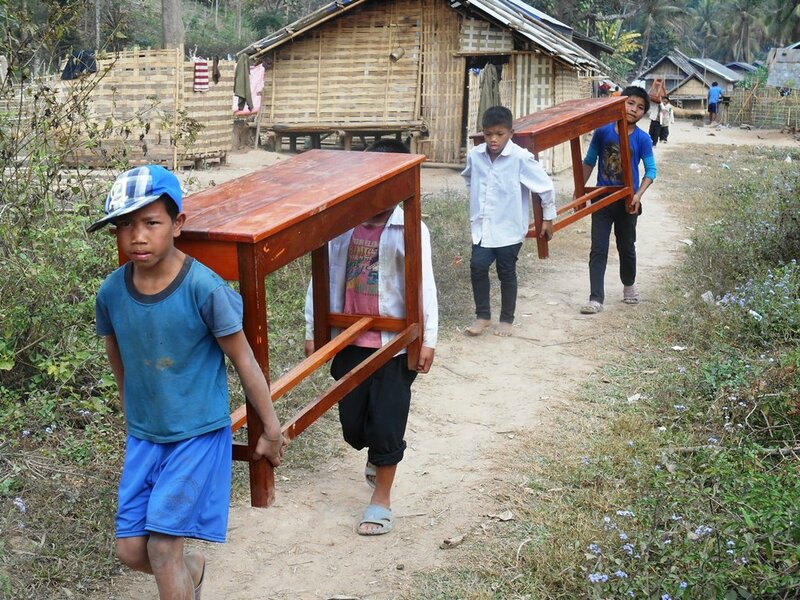 Transportation is always a challenge when going to Pha Yong Village. 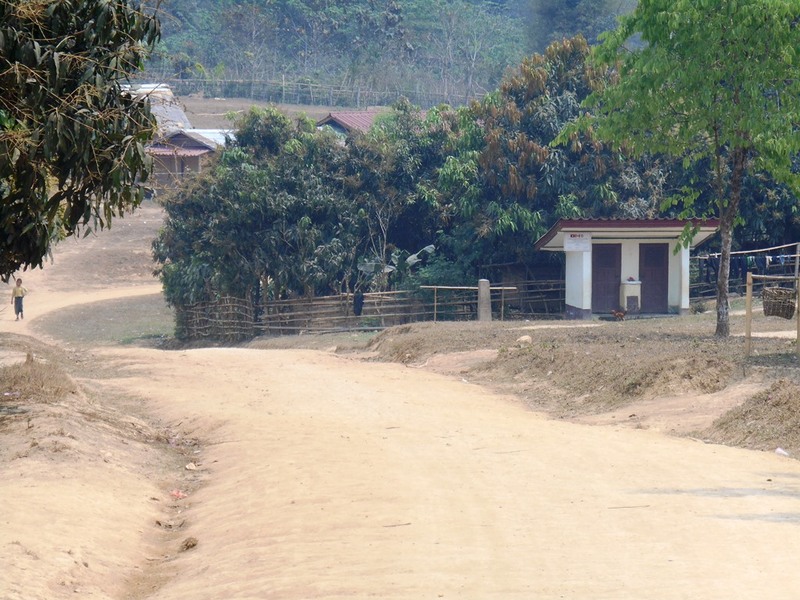 The roads are impassable during the rainy season and often covered by previous mudslides during the dry season. Still, we managed to find someone to take us – I just didn’t want another trek if I could avoid it. Here are some updates of the toilet project there, expected to completed in another 3 weeks or so. 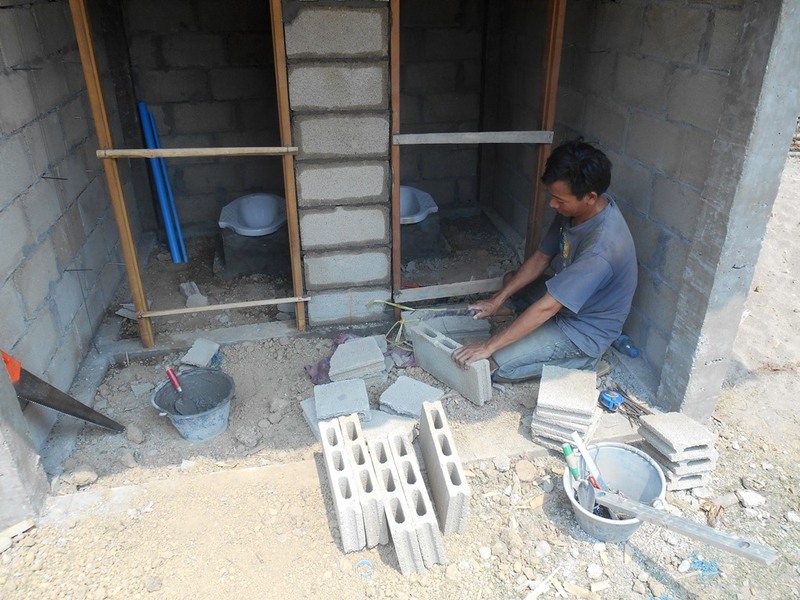 Souk, the contractor/worker is using his machete to split cement block for the toilet bank. That thought wouldn’t have even crossed my mind. As I was heading to check on the progress of the remaining 4 banks, this was a typical view of the village and standard toilet bank. The four banks of toilets are at varous stages of completion with the remaining two, just with the posts. 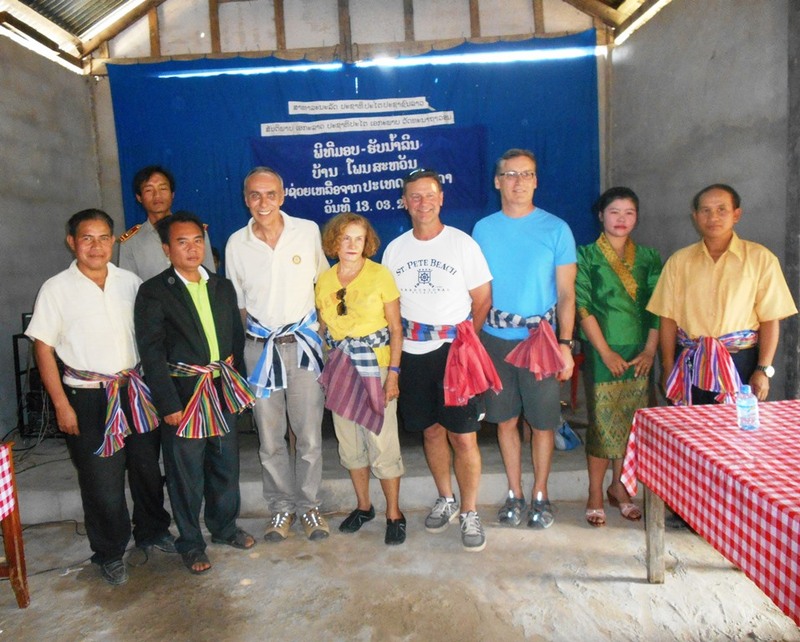 We had to stay one extra night in Nong Khiaw to meet the governor and his wife. We had tried during three previous visits but they were always out-of-town. This was no different but they had hoped to see us to before I headed back. This is the end of the governors last term, ending in May. He has served for 8 years now. I wanted to go over some of the projects, get updates on various things like the dams and perhaps share a meal with him and his wonderful wife who is the head of education in that district. 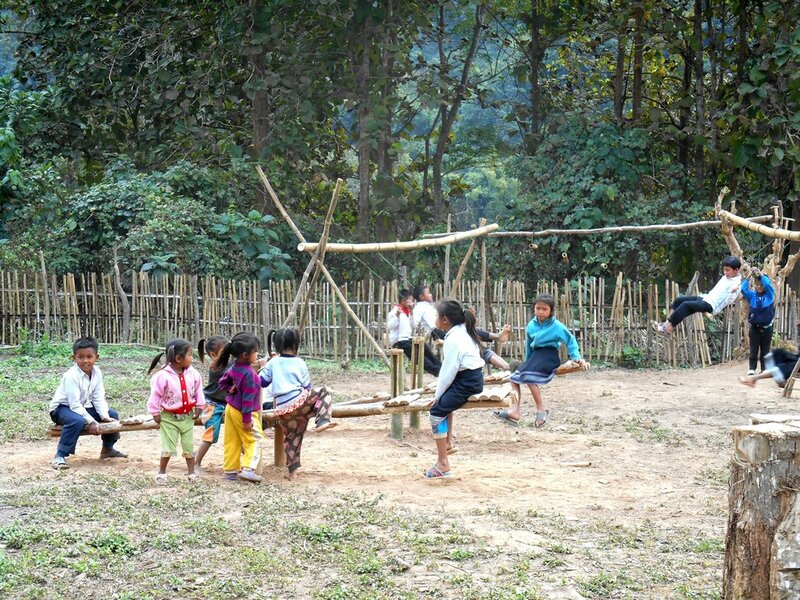 This picked us up right from their return from Luang Prabang and took us to their farm. I enjoyed the entire day with them, eating fresh grilled fish that had just been caught from the fish ponds and having drinks together. A LOT of eating and drinking on my part throughout the day and evening. What a way to end my visit. 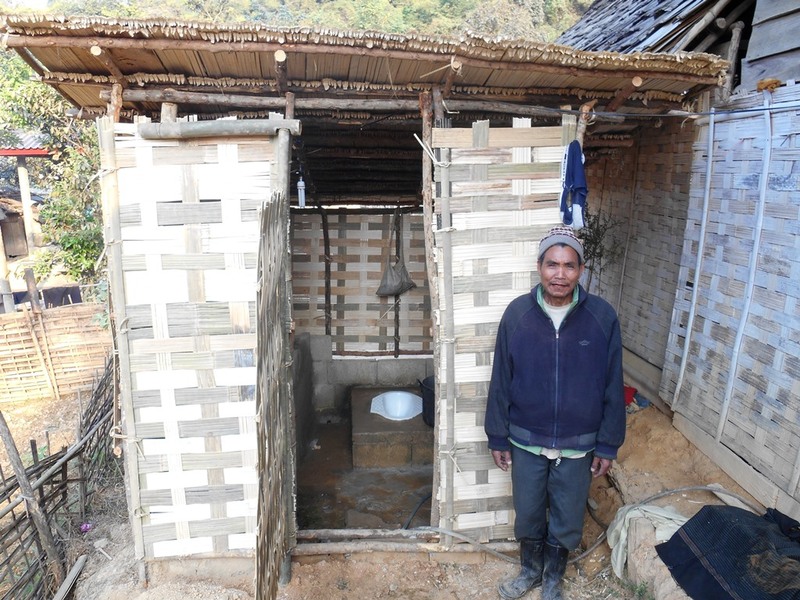 On one of our trips to the rural villages, we stopped by a family home in Nong Ein, where we had left building materials last year for the construction of a toilet. It was a large family and the two elderly parents were trying to support a family of 14 including two orphans with whom we are sponsoring to go to secondary school. We supplied only enough to do the toilet, base and sceptic system. Here is the result. This is the father of about 14, very happy to show off his handiwork. 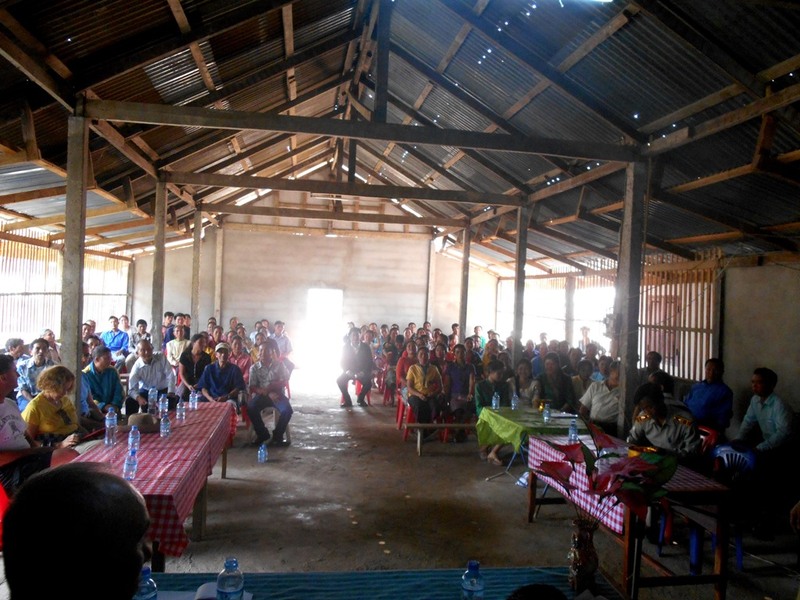 We continued with our Canadian Friends and several others to the poor village of Katang Xieng. The mission? To install solar panels into as many homes as we could. It turns out that we were able to light up 7 houses with two teams. 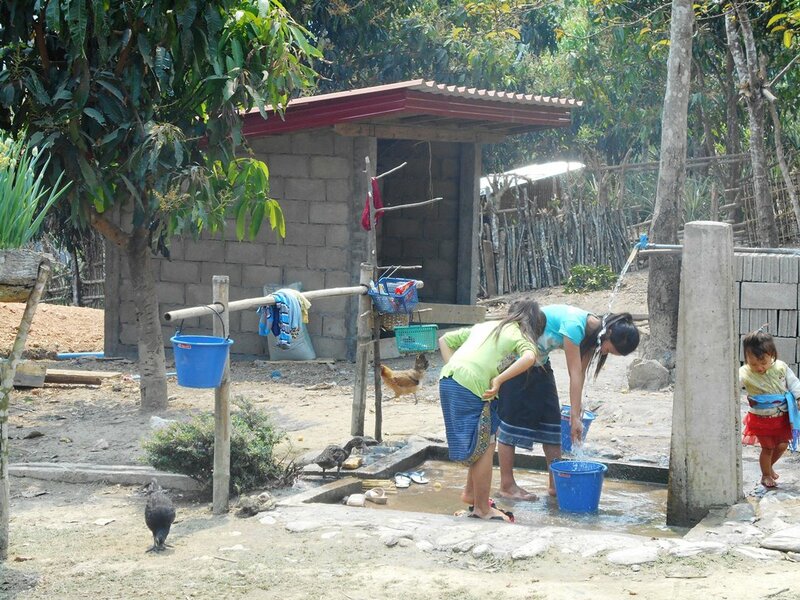 Due to very poor living and hygiene conditions, and no water source for the village, we didn’t want to stay overnight. I wish we had the foresight to take an amazing shot that we missed. There was an elder watching us and when we were done, he pointed to the switch on the wall and wondered what it was. You should have seen the look in his face when we gave him a demonstration! When we went back to install more panels, I did manage to get a shot of his daughter and granddaughter (he wasn’t there). She was so thrilled to be able to switch on the light at will. Later on when we returned to the village, we took a lot of donated sport shirts with us. Renee and Peter brought them from Canada on behalf of the sponsor, associated with Afrisoccer. I had wanted to provide clothing to this village for a couple of years now…so many kids running around without clothes and the adults and just tattered clothing. These are by far, the best clothes that these villagers own! 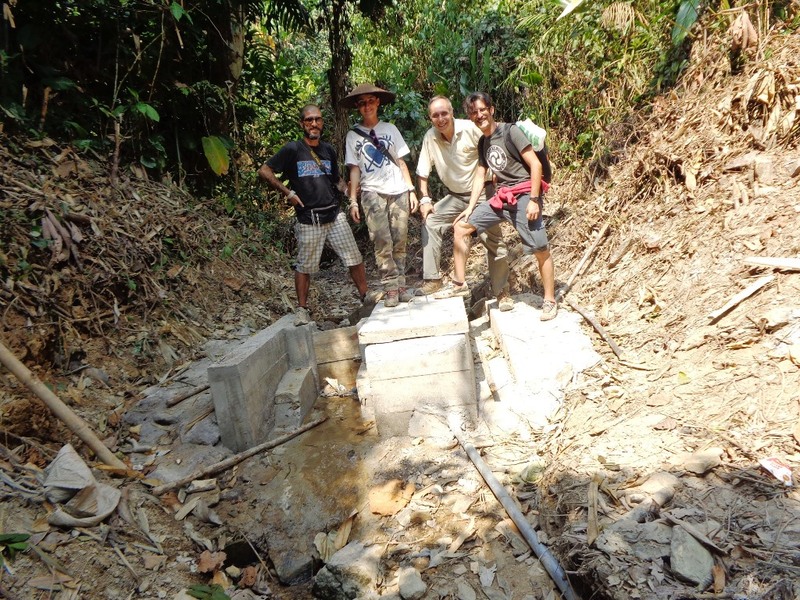 We stopped in the village of PhonSavanh to check on the large water project and discovered that other than some drying cement at a couple of the tapheads, it was done! In total there were two dams, 50 taps (13 old ones plus 37 new ones) and over 9km of pipe! The villagers helped with the cost too! 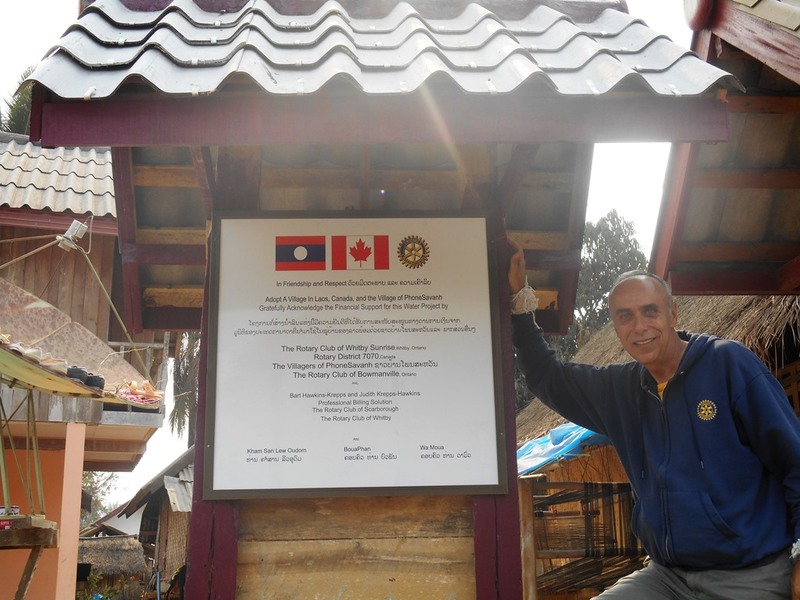 They are so happy now that they can also build new homes and toilets too, with thanks to so many Rotary Clubs and other sponsors. We have changed their lives. Here are some highlites. No need to go to the polluted pond to wash clothes and bring water back to drink. 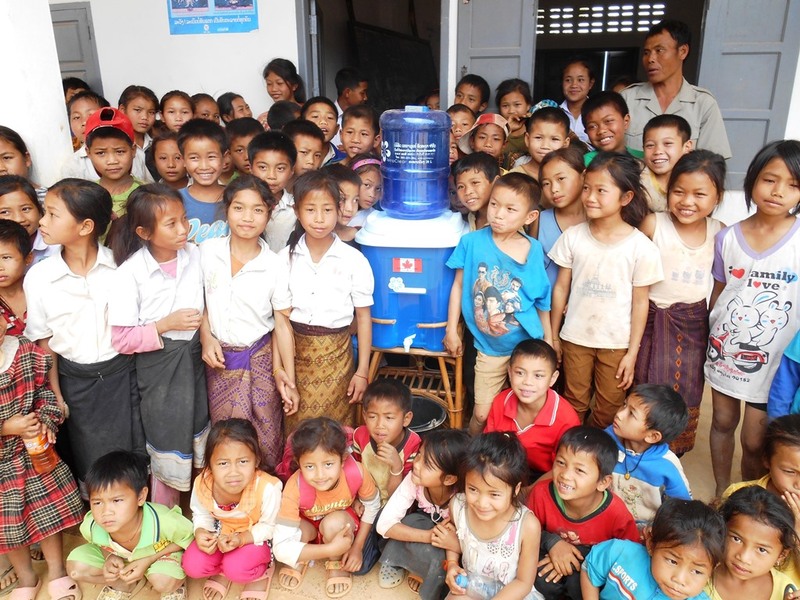 We also delivered the last of our water filters, all to schools. Our last stage of distribution and training was to 5 schools. 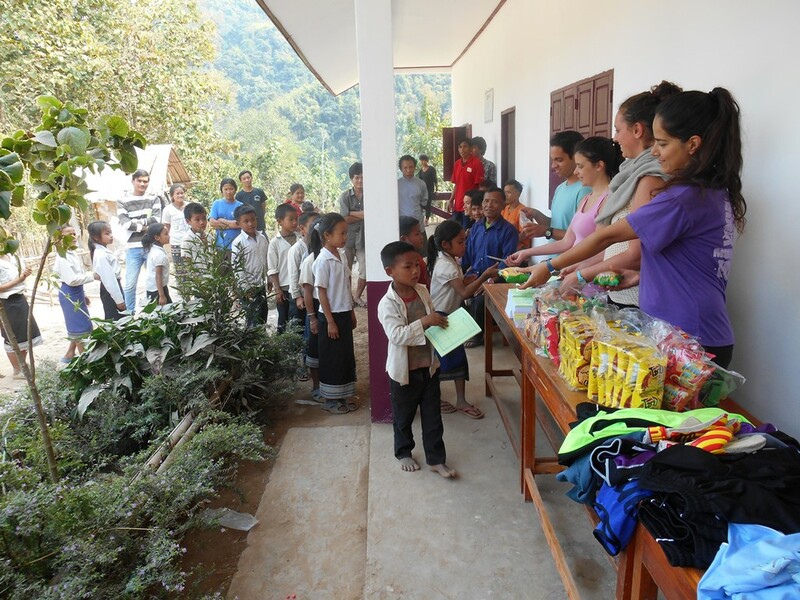 In total 525 were distributed this year, to a grand total of over 1200 systems including 7000 people! 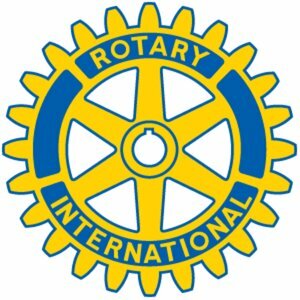 No sooner had our wonderful visitors from the Rotary Club of Toronto Twilight left, our wonderful friends form our hometown arrived. Renee and Peter McLachlin, owners of Paperworks in Port Hope and Ready Print in Cobourg, were our next guests of honour. They wanted to get involved in the projects so that is exactly what they did. 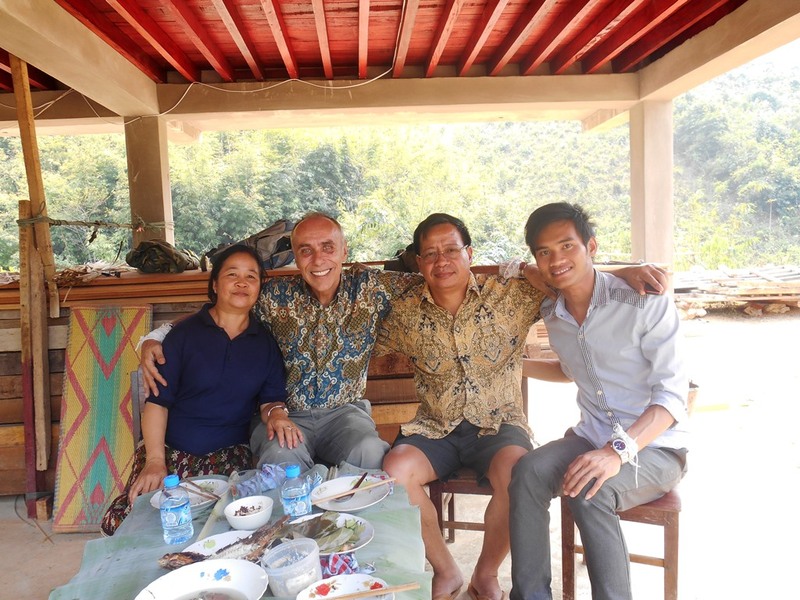 We took them up to Nong Khiaw with a couple of stops including one to see Siphan’s son. The little guy has huge eyes, just like his dad! Rather than staying in Nong Khiaw for the night, we headed upriver to Muang Ngoi to spend the next few nights. While there, we visited the school grounds where the entire district sent teams from many schools to compete in volleyball, patong, Lao folk dancing, and others. Unfortunately, on Renee and Peter’s first day in the villages, Renee sprained her ankle while chasing a runaway volleyball! To say she was p’d off at herself would be an understatement, BUT the team we sponsored, Pak Jeem, won! The Pak Jeem teams poses for us as they begin to celebrate their win! 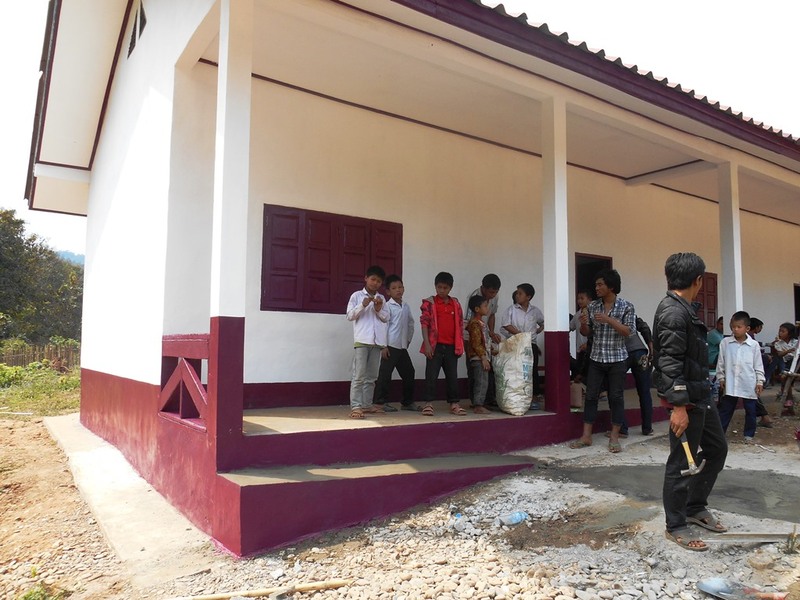 The following day was our first day in Hat Kham to complete the painting of the school. Of course, due to Renee’s minor injury from the night before, she become supervisor…kidding of course. We had also met a group of volunteers from Israel who were more than eager to assist us and help us finish the school in record time. Of course, many of them had a lot of paint on their faces, hands and feet, but the job got done! Part of the Israeli team in the foreground, Renee and Peter in the background. Peter was balancing the bench for Renee. Mike, The Israeli team and Siphan. This took us about 1 1/2 days. Within an hour of the school completion, the desks and signs arrived. It is such a wonderful feeling when things actually go as planned! The kids were all to eager to bring the furniture from the beach. Students and many of the team. Thanks to Afrisoccer, Hat Kham now has uniforms for the first time. They will be hosting the District games next year too. 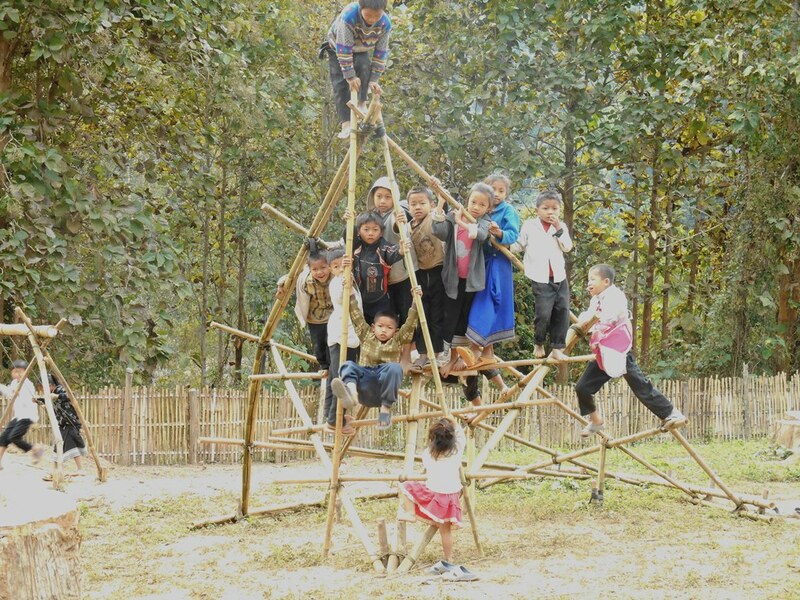 While others were building the school, Marcus and Charlotte from France designed and built a playground for the kids! The kids were pretty excited to show us the fun they were having.